The British Petroleum (BP) offshore drilling rig that exploded on April 20 dumped millions of gallons of oil into the Gulf of Mexico in the following weeks. For sea turtles, fish, shorebirds, seabirds, corals, dolphins, whales and other wildlife that live part or all of their lives in the Gulf of Mexico, the unprecedented oil leak is catastrophic. In both size and impacts, the BP spill is one of the nation’s worst environmental disasters, far surpassing the 1989 Exxon Valdez spill in Alaska. It threatens at least 400 species, 19 vital wildlife refuges, two national marine sanctuaries and dozens of communities dependent on the gulf’s multibillion-dollar fishing and tourism industries. The fact that the spill occurred just weeks after President Obama proposed expanding drilling off America’s coasts dramatically raised the stakes for wildlife. After revelations that the Interior Department’s Minerals Management Service (MMS) granted BP’s Gulf oil drilling operation a waiver from a full environmental analysis required by federal law, Defenders filed suit against the federal agency. MMS also exempted more than 20 new structures and exploratory wells from environmental review. In the days following the spill, Richard Charter, Defenders’ senior policy advisor for marine programs, began working with the nation’s top data analysts to predict the spill’s path to help wildlife rescue response teams plan their work. And a team of Defenders staffers led by executive vice president Jamie Rappaport Clark traveled to the Gulf Coast, toured wildlife refuges and met with government officials to assess the potential environmental damage and coordinate Defenders’ response. “Clearly this raises grave concerns for any expansion of drilling off our coasts in the future,” says Charter. Defenders was pleased when President Obama, in response to calls by Defenders and others, canceled exploratory oil drilling in Alaska’s Beaufort and Chukchi seas, which had been scheduled to begin in July; suspended deepwater oil drilling in the Gulf of Mexico; and canceled the sale of oil leases off the Virginia coast. Defenders has called upon President Obama and Congress to make these steps permanent. 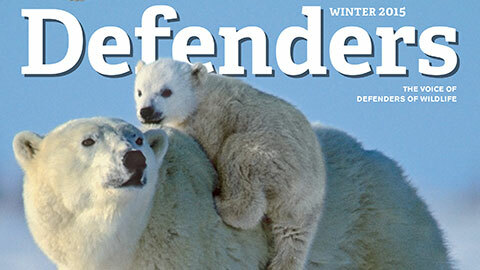 Defenders has also been aggressively lobbying the U.S. Senate to pass comprehensive climate change legislation that moves the country away from its dangerous dependence on fossil fuels and addresses the impacts of climate change on wildlife. Habitat loss from agriculture and urban development along their way are putting these majestic migrators at risk. Defenders and ranchers are working together to conserve land and species.